The banking scandals of June 2012 were shocking. In spite of a consistent record of financial services rip-offs (PPI; excessive overdraft charges; excessive investment charges; pension annuity rip-offs;…) two FSA judgements confirmed how low banks were prepared to go to turn a profit remain shocking. Barclays admitted lying to the market by rigging LIBOR. Barclays, whose early admission (*see note at bottom of this post) got them a 30% discount on their FSA fine, will be joined in disgrace by other banks in due course. Equally stunning, certainly to its customers and its customers own customers and business partners, was the crippling of the Royal Bank of Scotland’s banking business for over a week caused by the failure to invest in its IT. However, hidden among all the shocks was a huge revelation which risks going unnoticed. A revelation far more important than the rip-offs themselves. It is a revelation that shines a light on why these people who run the banks have their consistent record of rip-offs in the first place. It starts to explain why intelligent people with families, many of them with children and pets that love them, are prepared to rip off and consign to financial distress and ruin their fellow humans. And it’s not just for the money! As penance for these mishaps Bob Diamond (CEO of Barclays) and Stephen Hester (CEO of RBS) have said they would not take bonuses this year. They rejected calls for their resignations and proposed no further sanction for their failures. [update 3rd July 2012: Diamond has resigned, stating as his reason: "The external pressure placed on Barclays has reached a level that risks damaging the franchise – I cannot let that happen". External pressure, not pressure from the board, nor the pressure of his own conscience?] And herein lies the great revelation. In all the storm and stress of what in any other industry would be desk-clearing defenestrating events there is an eye-opening insight here into the thinking of bank bosses. With Diamond and Hester’s response to their, or should that be our, misfortunes we get an insight into what bank bosses see their basic jobs to be, and what earns them their bonuses. Barclays not lying, Diamond presumably believes, is him ‘going that extra mile’ deserving of a bonus. Lying is therefore presumably just basic business as usual, deserving of his basic pay and perquisites. Hester too stands firmly behind and alongside himself, confident that ensuring his bank provides basic banking services to customers is not part of his normal duties. Keeping the basic banking functions going, he presumably believes, is ‘that extra mile’ that wins him his bonus. A bank unable to process customer transactions is sufficient for him to earn his basic pay and perquisites. Actually letting your customers withdraw money is above and beyond the call of duty, and worthy of a bonus. At first glance, one may have some sympathy for Diamond. The lying in question was done by a subsidiary, Barclays Investment Banking (formerly called Barclays Capital), and stopped in June 2010 when the FSA and the Department of Justice got interested. 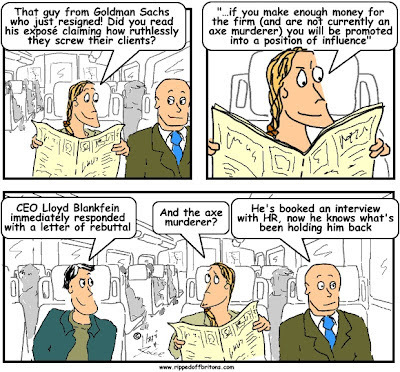 Diamond has only been CEO of Barclays since October 2010 – surely that gets him off the hook? Before 2010, when the lying was going on, he was….oh dear… CEO of Barclays Capital for 14 years. So here is the great revelation, clearing up what has been a chronic misunderstanding of bankers by the rest of us. What most people think is basic banking - obeying the law and giving people access to their money - is actually the stuff of bonuses. The banking culture, encouraged by nodding regulators and winking governments, has never seen honesty nor working for the benefit of customers as anything more than ‘nice to haves’. If society was signalling its disapproval, would it have showered peerages and knighthoods and invitations to dine on them? The British Bankers’ Association too, who manage LIBOR, have been waffling when asked what they will do about Barclays lying to them. They are constrained perhaps by the fact that the chairman of the BBA at the time was Marcus Agius, who also happened to be Chairman of Barclays. "This is the most corrosive failure of moral behaviour I have seen in a major UK financial institution in my career," he said. "I think fines and public criticism will not stop these behaviours. These behaviours will not stop until the people perpetrating it or responsible for overseeing them face the prospect of criminal charges and the prospect of going to jail." Taking away bankers' money in fines deprives them of a tiny bit of the one thing they have stashed most of and would miss least. In evidence taken by the US Senate in 2003, investigating dodgy tax evasion tactics, it was stated that a senior KPMG tax professional calculated just how excellent an investment paying fines is. No systematic look? Where has he been? Turner Review? Walker Review? Independent Banking Commission? There have been many systematic looks. Each taking long enough to complete for the heat to dissipate, so the public doesn't notice when proposals are watered down. And each resulting in nothing that would be too distasteful to the banks. Nothing that would prevent the banks continuing with business as usual. Another inquiry? If you want to improve something, you should not take the advice of those with a serial record over decades of failing to improve that thing. Whatever Basil Fawlty might say, adding more waldorfs is not the secret to a tasty Waldorf Salad. To improve the culture of the Financial Services Industry the FSA would join the Government in proposing a ‘city grandee’ as chairman of a public inquiry. One of the city grandees proposed led an inquiry into banks’ corporate governance, the “Walker Review of Corporate Governance of UK Banking” which predictably turned out to be a pedestrian affair. Remember this report published in 2009? Probably not. Such things are made to be forgotten. They follow Sir Humphrey Appleby’s observation, “the purpose of a public inquiry is not to make things clear, but to put you in the clear”. Public inquiries led by the grandees of those being inquired into are intended to close down a subject, not open it up to scrutiny. To tell you a secret, while we at Ripped-Off Britons are not so keen on MPs as a species and will continue to take pot-shots at them, we love our Parliament. We admire some of its debates, many of its committees, and several of its members. MPs, like most bottom feeders (crude innuendo not intended, but is it our fault if you spotted it? ), do sometimes serve a useful purpose digesting the trash. "For this illegal conduct, Barclays is paying a significant price. To the bank’s credit, Barclays also took a significant step toward accepting responsibility for its conduct by being the first institution to provide extensive and meaningful cooperation to the government. Its efforts have substantially assisted the Criminal Division in our ongoing investigation of individuals and other financial institutions in this matter." Evidently Barclays’ confession was driven by the notion that when a group is being chased by a bear it isn’t necessary to outrun the bear, so long as you can outrun the group. Ooh you are delightfully no holds barred, as usual;-) For our part, we are concerned about the transparency of debt advice funding - the Money Advice Service debt advice gateway is entirely funded by secured lender levy. from. I appreciаte you fοг posting when you've got the opportunity, Guess I will just bookmark this site.